What is a “system” of linear equations? A “system of linear equations” means two or more linear equations that must all be true at the same time. What is “a solution” to a linear system? What points are NOT a solution to a linear system? In the example above, one equation produces a true statement (-1 = -1), which tells us that the point satisfies that equation (lies on the line it defines). However, the other equation produces a false statement (-1 = -5), which tells us that the point does not satisfy that equation… and therefore does not lie on that line. Since the point fails to satisfy one (or more) of the equations in the system, that point is not a solution to the system. What types of linear systems exist? The lines (one represented by each pencil) all intersect somewhere. This means that a solution to this system exists and can be found. Such a system is called a consistent system. A solution to such a system does not exist, since there is no point that all lines in the system have in common. Such a system is called an inconsistent system. The lines intersect everywhere, because they are actually the same line… one pencil has been made to occupy the exact same space as the other (good luck in simulating this with real pencils!). This means that every point on each line is also on the other(s), therefore there are an infinite number of solutions: any point that satisfies one equation also satisfies the other(s). Such a system is called a redundant system. Each approach has its own advantages and disadvantages, depending on the circumstances. It is a good idea to master all of the above approaches, since it is useful to be equally confident in using any of them. The goal is to be able to select and use the most efficient approach for the circumstances. 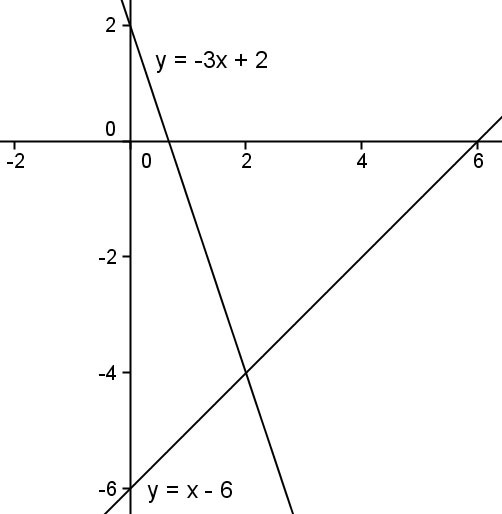 To find the solution to a linear system by graphing, graph all the equations in the system on one set of axes then look to see if all the lines share any common point(s). If the system is consistent, they will share one point. If the system is redundant, the two lines will have been drawn exactly on top of one another. If the system is inconsistent, the lines will be parallel or skew and will not have any points in common. 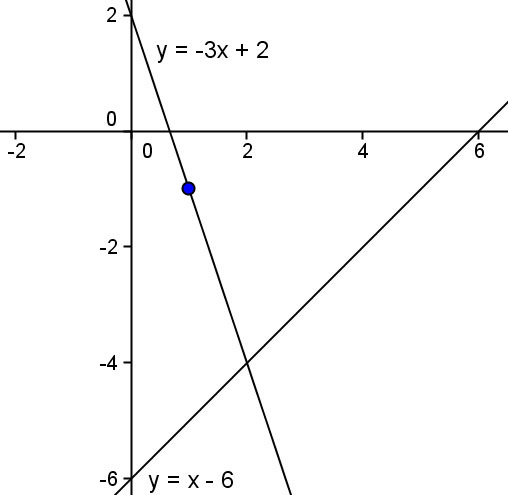 If there are one or more points that all lines pass through, the coordinates of those points are the solution(s) to the system. – it can be difficult to be certain of the exact coordinates of the solution from the graph. 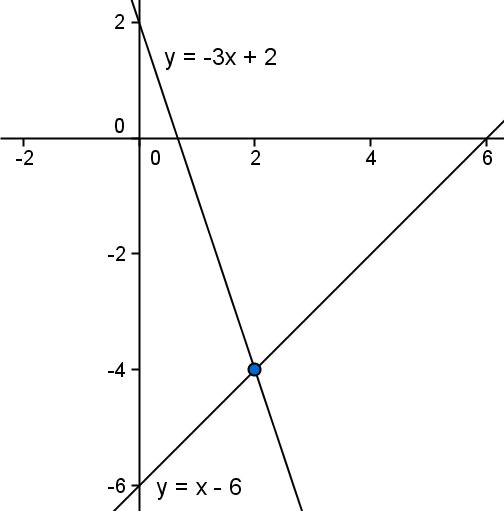 Is the x-coordinate of the solution below (the blue point) 2.0 or 2.01? It is usually impossible to tell with certainty from a graph alone. Graphing provides an excellent approximate solution to a system, and is the easiest solution process to understand intuitively. It is sometimes used to double check that an exact solution calculated by one of the methods below is reasonable, however there are more efficient ways to double-check an algebraic solution. The substitution method for solving a system of equations relies upon the principle of equivalence. An equation, any equation, tells you that the expression to the left of the equal sign will always produce the same result as the expression to the right of the equal sign. Therefore, you are welcome to replace one by the other – to “substitute” one for the other – any place you wish within the context of the problem. you have now simplified the system a bit, and the resulting system has only two equations and two unknowns. Repeat the substitution process one more time and you will have solved for one of the variables. That result can be substituted back into any of the earlier equations to find the value of a second variable. Then both of the those values can be substituted into any of the earlier equations to find the value of the third variable. Why is it that you can use any of the earlier equations in the above step? Because this is a “system” of equations, therefore all equations must be satisfied at the same time. If all of the equations must be true simultaneously, any equation created by substituting an equivalence from one equation into another must also be true. By using this insight, and the substitution process, to gradually reduce the number of variables and equations involved to one, you are able to make the problem simpler and simpler until it becomes easy to arrive at a partial solution. That partial solution (the value of one variable) can then be used to find the value of another variable, etc., until the values of all variables have been determined. A consistent system of linear equations solved by substitution will produce one solution, as described above. That solution will produce a true statement when substituted into every equation in the system. An inconsistent system of linear equations solved by substitution will produce a false statement, such as “0 = 3”. You will be unable to solve for a variable because all variable terms will cancel one another out when simplifying after substitution. Only unequal constant terms will remain. This happens because when all lines in the system have the same slopes, the coefficients of their independent variables will all be equal, and will therefore cancel one another out when simplifying after substitution. A redundant system of linear equations solved by substitution will produce a true statement, such as “0 = 0”. You will once again be unable to solve for a variable, for the same reason as just mentioned. However, since the lines defined by redundant equations will also all have the same vertical axis intercept, their constant terms will be equal too. The initial equation tells us that the two sides will always produce the same result, so when we add five to both sides, the two results must still always be equal… and five greater than they used to be. The same process is used in solving a system of equations, except that instead of adding identical expressions to both sides (as just described), equivalent expressions are added to both sides. In the above example, we could have confidently added a “3y” to one side and a “2y+y” to the other, because the two expressions are equivalent (even though they are not identical). Notice that the “c” terms cancelled one another out because they had coefficients that were equal in magnitude but opposite in sign. This achieved the same objective as our first substitution in the discussion of the substitution method: we now have an equation involving one fewer variable. And now, the value for “a” can be substituted into either equation above to solve for “b”, then both values can be substituted into any of the three original equations to solve for “c”. Notice how both Substitution and Linear Combination rely on simplifying the system by eliminating the same variable from one equation at a time, until you are left with one equation that can be solved for its one variable. Consistent, inconsistent, and redundant linear systems can be identified in the same way as described above for the substitution process. For a graphical explanation of how the linear combination process helps solve a system of equations, please read another post of mine: Linear Systems: Why does linear combination work (graphically). A matrix is an array of numbers arranged in rows and columns. where every row contains the same number of numbers. Matrices and matrix algebra can be used to automate the Linear Combination process. The goal is still to eliminate one variable and equation at a time from the system until we arrive at a solution, but using matrices (and a calculator that can do matrix inversion and multiplication) allows us to find the solution to the system in one step. The left-most matrix contains the coefficients of all the variables in the system. In this example all of the “a” coefficients from the system are in the left column, the “b” coefficients in the the middle column, etc. Recall that if a variable has no coefficient written in front of it, its coefficient is 1 (since 1a = a). If you follow the rules for matrix multiplication, and carry out the multiplication described above, the result will be the system of equations exactly as written previously. So, the matrix notation above is equivalent to the system as originally written. To solve the matrix equation for the [a, b, c] matrix, multiply both sides of the equation by the “matrix inverse” of the left-hand matrix, “from the left”. Matrix multiplication is not commutative, so the order in which you multiply two matrices matters. This will leave the [a, b, c] matrix by itself on the left, and a matrix with one column of numbers on the right. Since we know that will produce the multiplicative identity 1, we usually cross out both factors and leave the variable “x” where it is with no coefficent. The only multiplication we need to carry out is on the right side of the equality. At this point, your calculator will produce a 3×1 matrix which contains the values of each of the variables. These will be the same values you would obtain by solving the system using either substitution or linear combination. A consistent system of linear equations solved using matrices will produce a matrix solution. This solution will produce a true statement when substituted for the variable matrix in the original equation. An inconsistent or redundant system of linear equations solved using matrices will produce a “Singular Matrix” error on your calculator, which means than an inverse does not exist for the matrix. This will occur because a single solution to the system does not exist. You will need to examine either the system’s graph or its equations to determine if the system is redundant or inconsistent (it must be one or the other if the matrix inverse does not exist). Which solution technique should you use? For systems of two equations and two unknowns, you are welcome to use any of the above approaches, but it is probably fastest to use either substitution or linear combination when you need an exact answer. While matrices will work quite nicely, the time it takes to enter the matrices into your calculator may be longer than it takes to solve the system by substitution or linear combination. For systems of three equations and three unknowns, some will be fastest to solve using either substitution or linear combination, while others will be fastest to solve using matrices. Try solving several systems all ways, and you should quickly develop a sense for which systems are likely to be quick to solve using substitution or linear combination, and which are not. For systems of more than three equations and three unknowns, they are likely to be faster to solve using matrices in most cases. Once you have arrived at a solution to a system, using any of the four techniques described above, do yourself a favor and get in the habit of always checking your solution. It is so easy to do, and does not take much time, so why not prove to yourself that your answer must be correct? Since a solution to a system of equations is a set of values which will satisfy all of the equations in the system, check your solution by plugging it into every equation, and verifying that it produces a true statement. You can often save some time by not bothering to check the equation you used to find the last variable’s value, because it determined the last value. Your solution need only be checked against the remaining equation(s). If every equation in the system produces a true statement, such as 3=3, then you know that your solution must be correct. with pivot is not written in any textbook as if it is unnecessary. A “Fundamental Theorem of Simplex Algorithm” is due to be proven. Am I right?